•These sampling tools will generate a random distribution of sampling points across your network. 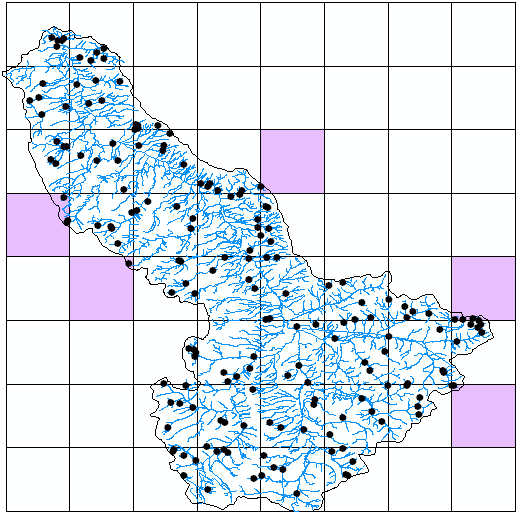 •You can stratify your sampling with a grid that RivEX can generate or a user provided polygon layer such as an administrative \ catchment boundary. This network has been randomly sampled within each 10Km cell for 5 sites. RivEX was set to apply an exclusion zone of 250m around for each point. The cells highlighted in pink are cells that intersect the network but failed to generate 5 sites as they could not fulfil the sampling criteria. This was due to the small amount of network within the grid cell. The exclusion zone would have stopped the placement of any further points within a 250m vicinity.